The Bradleys and their partners took the Red Agave and turned that business around in the time they were owners, Cassie said, “We were able to build it back up to something great. It became a place where people loved to come with their families year after year. We’re doing the same thing here except starting from scratch this time,” she said. The Bradleys own the Oaisis Bar in downtown Sturgis. The C&D Sales building is directly across the street and adjacent Harley-Davidson Rally Point. Cassie Bradley who has extensive experience with the marketing side of the hotel business said boutique hotels are typically smaller than other hotels and have unique characteristics. Sturgis is known as the city of riders, which in the Bradleys estimation means more than just motorcycles. The town is forging a reputation as a premiere mountain biking area. “Our audience is active people, people who like to be out and about,” Cassie said. Locals who have heard about the project have been encouraging, the Bradleys said. People are excited about it,” Cassie said. Sturgis Main Street carries the stigma that it is only active during the annual Sturgis Motorcycle Rally. 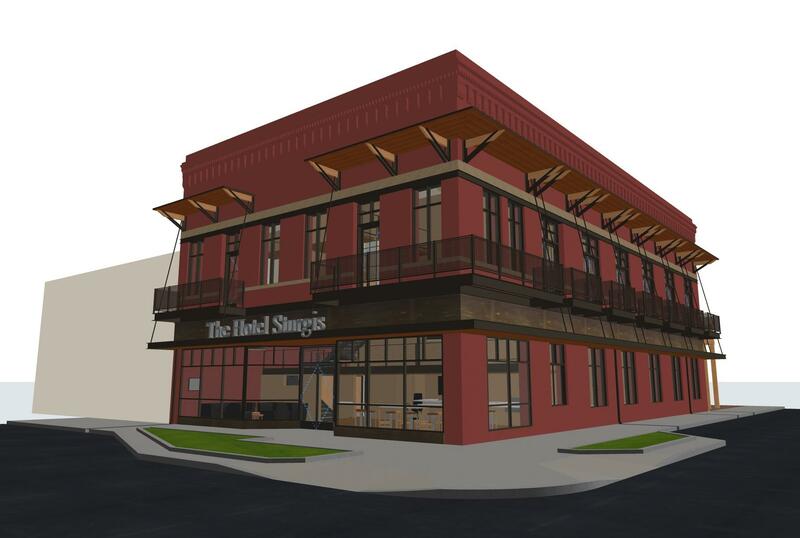 STURGIS (11/26/2018) – The owners of The Knuckle Saloon and The Knuckle Brewing Co. invite the public to attend a groundbreaking ceremony for their latest microbrewery, The Sturgis Brewing Co. 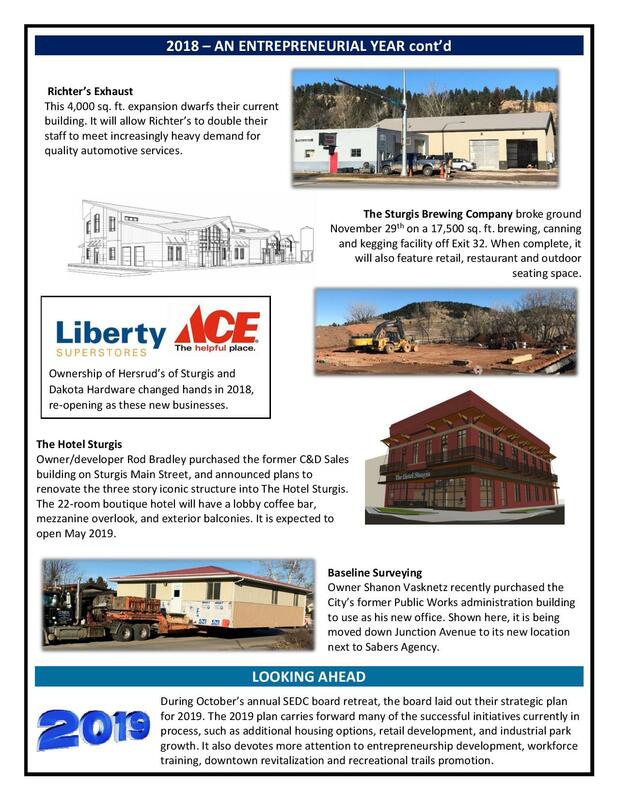 It will be held Thursday, November 29th, 10:00 a.m., at the construction site at 600 Anna Street, just off Exit 32, Sturgis. RCS Construction recently started site mobilization on the 17,500 sq. ft. building designed by TSP Architects. In addition to brewing, canning and kegging, the new manufacturing facility will include a tasting room, restaurant and retail space. It is expected to be operational in May 2019 and employ an additional staff of seven to start. After opening The Knuckle Brewing Co. in 2014, an expansion was needed only two years later to meet the demand. In 2017, state legislation authorized an increase in the number of barrels that can be manufactured annually. The new Sturgis Brewing Co. manufacturing facility will provide the space needed to be competitive and increase capacity to meet wholesale distribution demand. 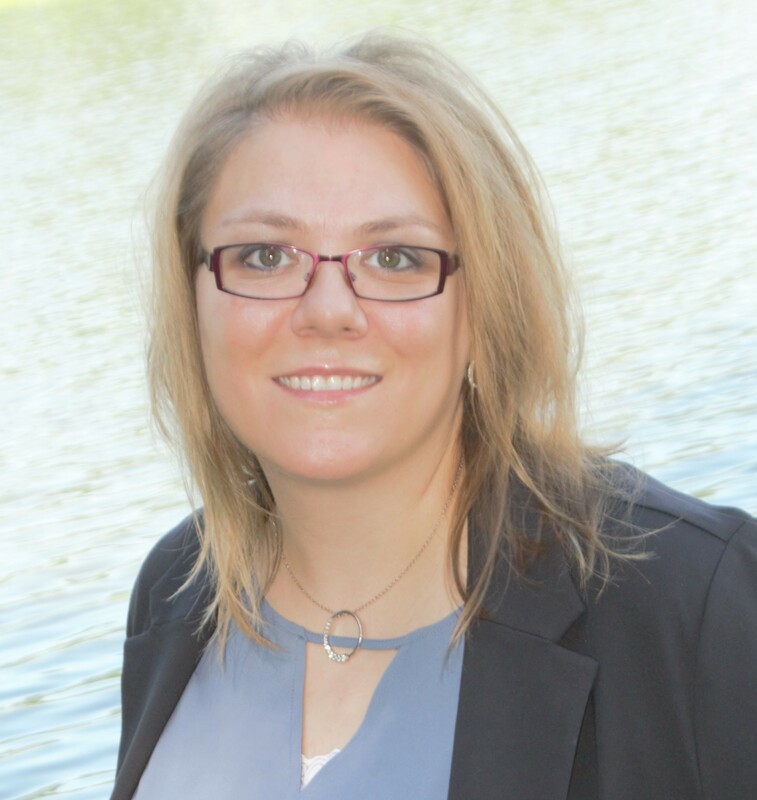 STURGIS, SD (9/25/2018) – Following a nationwide search, the Board of Directors of the Sturgis Economic Development Corp (SEDC) announces that Amanda Anglin has been appointed SEDC Executive Director effective October 15, 2018. Anglin is a South Dakota native and graduate of South Dakota State University. She has been employed in various city government capacities, most recently as the City Administrator for the City of Lennox, SD. She also currently serves as Vice President of the Lincoln County Economic Development Association. Amanda and husband Mitch will be relocating to Sturgis with their two children. Anglin will replace SEDC President Pat Kurtenbach, who will retire at the end of the year. 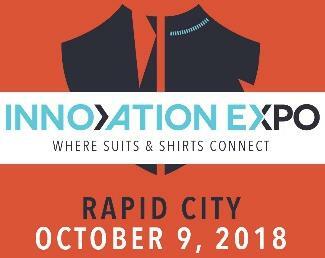 will be Tues., Oct. 23rd, 12:00-1:00 pm, at the Boulder Canyon Convention Center (next to the Baymont Inn) in Sturgis. During this luncheon, discussion will center on general development and the Board will gather input from members. Invitations will be sent out the first of October. As always, membership feedback will be taken into consideration at the annual board retreat later in the year. It’s been another busy summer in Sturgis and Meade County. Sales tax revenues, as well as residential and commercial construction, continue to be strong. 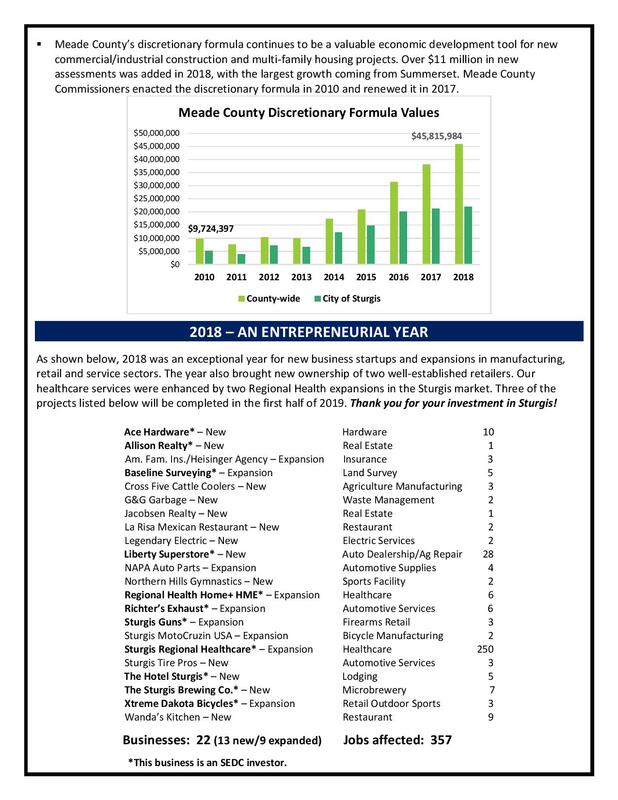 Below is a quick snapshot of some of the new business start-ups, relocations, expansions and planned expansions. Thank you to these business owners for their investment. Thank you to everyone who shops locally and supports them. 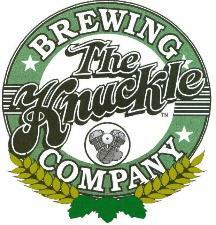 The Knuckle – The Knuckle Brewing Company is expanding – again! The owners purchased a 1+ acre site off Exit 32 on Anna Street, immediately south of the Church of Jesus Christ of Latter-day Saints. They are in the design process to engineer the building and site, and expect to be brewing by next summer. This facility will allow The Knuckle to take advantage of 2018 legislation allowing microbreweries to increase production volumes and expand distribution channels. The expansion will provide even greater exposure for both The Knuckle and Sturgis. Indian Motorcycle Sturgis – The dealership experienced another expansion this summer with the construction a freestanding 5,700 sq. ft. retail display building on the Sturgis campus at 2130 Main Street. Indian Motorcycle Sturgis first opened in 2014; their flagship store was built in 2015. Liberty Chevrolet – Earlier this month, Don and Max Patnoe purchased Hersrud’s of Sturgis from David Hersrud. With the name change, Liberty Chevrolet joins the Rapid City-based Liberty Superstores, which include Jeep, Chrysler, Dodge, Ram, Fiat, Mazda, Hyundai, Volkswagen and Mitsubishi brands. The sale did not include the New Holland franchise nor Hersrud’s of Belle Fourche. Liberty Superstore General Manager Max Patnoe says, “We’re excited to be part of the Sturgis community!” David Hersrud will remain on site during the transition. Sturgis Guns & Sturgis Powersports – Earlier this month, owners Justin & Tammy Bohn relocated to their new 3,100 sq. ft. facility at 20580 Fort Meade Way. In addition to retail firearms-related products and services, and aftermarket parts and accessories for motorcycles, UTVs and ATVs, the Bohn’s also offer U-Haul and FedEx services this location. Plans are underway to renovate the Buffalo Chip’s outdoor shooting range to offer additional shooting options. eXp Realty – Dan Jacobsen recently opened Dan Jacobsen Realty at 1940 Junction Avenue. Dan specializes in residential real estate and commercial land. 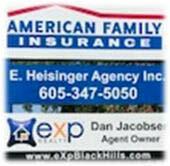 He can be reached at 490-1663 or dan.jacobsen@exprealty.com Dan is located next door to Eddie Heisinger’s new American Family Insurance office. NAPA Auto Parts/Sturgis Tire Pros – NAPA Auto Parts recently relocated to 2324 Junction Avenue. This retail expansion also allows owners Larry and Jim Heil to incorporate a customer auto care center for their new business next door – Sturgis Tire Pros. Their Sturgis staff of three has grown to seven, and is expected to continue to increase. 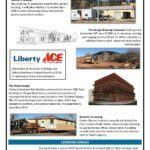 Larry says, “Everyone in Sturgis has been great to work with.” To make your appointment for tires, lube, alignments, brakes, air conditioning, and mechanics, call 720-8315.
www.northernhillsgymnastics.com to keep up to date on the progress or follow the construction on Facebook. Senior Independent Living – The facility’s developer and manager continue to define the details of the project. While their goal of a 2018 summer construction start has been delayed, they expect to break ground in Spring 2019 on Phase I of a 60-unit independent living campus adjacent to Aspen Grove Assisted Living. Jeff Dragseth, General Manager of CBH Cooperative, regretfully resigned his SEDC board position in May. Since CBH acquired the Gillette, WY operation in May, Jeff has needed to focus on merging and structuring the organizations. According to SEDC bylaws, the SEDC board can appoint someone to fill a vacancy until the next Annual Meeting of Members. Karen Simmons, CPA, has accepted this board appointment. Please join us in welcoming Karen to the SEDC board. Sturgis MotoCruzin USA is expanding. They have leased the 9,600 sq. ft. SEDC spec building in the Sturgis Industrial Park. The building is being completed to their specifications and will be ready within 8-10 weeks. Sturgis MotoCruzin USA was formed in August 2016 as a licensed manufacturer, marketer and distributor of Motopeds and have since continued to expand their product offerings. For the last two years, they have been leasing the rear portion of the Samson Exhaust building in the Sturgis Industrial Park. Construction numbers as of June 30. 2017. 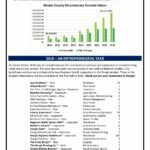 The City’s total value of all new permits YTD is $10.2M, compared to $10.4M for all 2017. 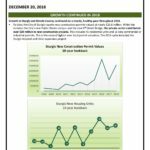 Meade County issued 133 building permits (the same number as last YTD), totaling $10.9M. This is on track to exceed 2017’s total of $20.1M. will host a community ribbon cutting and open house on Tuesday, September 25, 4:00 – 6:00 pm. Food and beverages will be served. Please join in welcoming developer/owners Tim and Peggy Heuston to Sturgis. Wildflower Townhomes is located at the corner of Fulton and Boulevard Streets. The SEDC Personnel Committee is reviewing the applicants and starting the interview process. Our goal is to have the new director hired and on staff no later than October 1. This would allow at least a 3-month transition period for Pat to train with the new director. Main Street sculpture and benches. On June 27th, the Downtown Sturgis Foundation unveiled the latest permanent sculpture to adorn Sturgis Main Street. This life-size bronze statue depicts champion hill climber and dirt bike racer Joe Petrali on his 1-mile, 136.183 mph record-setting run at Daytona in 1937. The statue was strategically placed in the bump-out in front of Wells Fargo Bank welcoming everyone to Legendary Main Street. The inscriptions on the granite base recognize individuals and organizations involved in its placement. Along with permanent artwork, the new Sturgis Main Street will include benches with matching trash receptacles. With a tax deductible donation to the Downtown Sturgis Foundation, residents, organizations, businesses, etc. can purchase a bench with a personalized bronze plaque. The first five benches are ordered and will be installed this fall. SEDC financially contributed to both the bronze sculpture and a Main Street bench, and encourages others to also participate in this exciting downtown revitalization project. 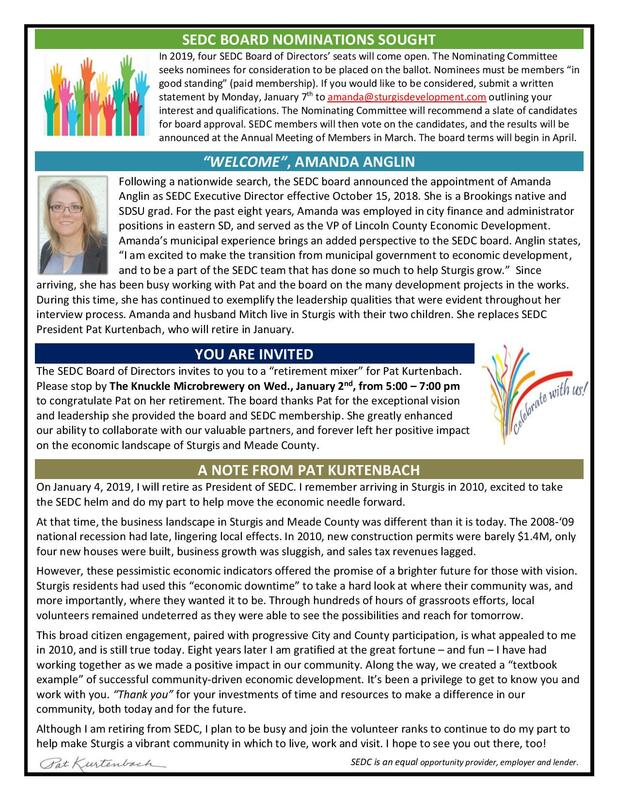 STURGIS (6.8.2018) —At the annual board retreat of the Sturgis Economic Development Corp, SEDC President Pat Kurtenbach announced her plans to retire at the end of 2018. Kurtenbach has been at the helm of SEDC since 2010. The SEDC Board will begin a nationwide search this month for her replacement. STURGIS (4.10.2018) — Ten years ago, residents of Sturgis, business owners and city officials gathered at a town-hall meeting to talk about a plan for their community’s future. Sturgis Economic Development Corporation (SEDC) President Pat Kurtenbach remembers that as a watershed moment for Sturgis. 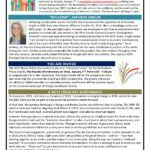 The Future Sturgis Initiative, funded in part by SEDC, defined a grass-roots movement charged with identifying areas of improvement to enhance Sturgis’ live-ability index. 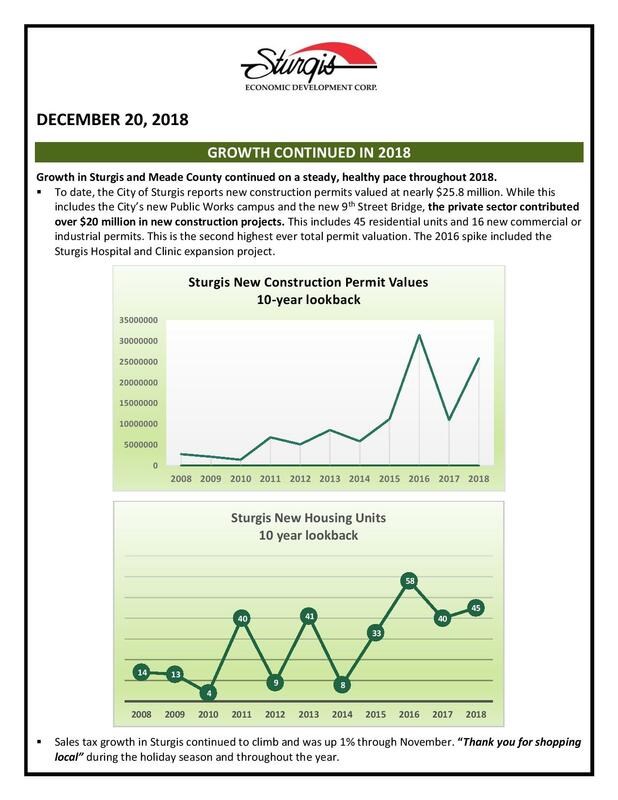 Its recommendations were incorporated into the Sturgis Comprehensive Plan and today form the platform for many of the city’s business- and growth-friendly decisions. Speaking at SEDC’s annual board meeting Tuesday, Kurtenbach said many of those in attendance were involved in the Future Sturgis Initiative. “It’s hard to believe that it has only been 10 years and to look at the changes that have happened in that time is incredible,” she said. At the time of the town-hall meeting, residents said they wanted more and better amenities for their community. “Those listening session turned into action. That action led to change, and the change led to where we are today. I see us as a pacesetter,” she said. Kurtenbach said she recently visited Hot Springs at their economic development annual meeting when a speaker made reference to the Future Sturgis Initiative. People in the region look to what has happened in Sturgis as an example of what can happen economically when a community does strategic planning and forges partnerships, Kurtenbach said. 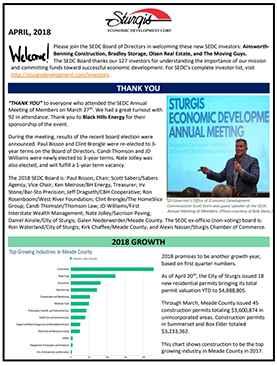 Scott Stern, the commissioner of the Governor’s Office of Economic Development, agreed and said Sturgis has been a shining example of a community that controlled its own destiny. He also lauded the efforts of Kurtenbach for the community’s economic development success. Stern said it requires very vigorous and strategic activity to succeed in economic development. “Economic development does not happen on its own. It just doesn’t show up someday,” said Stern, the keynote speaker at Tuesday’s meeting. At the state level, the GOED office has doubled its community development representation in the past year. “We felt it was very important to be more closely connected with our communities,” Stern said. “If we don’t understand what is going on in a community we can’t help them and vice versa.” And it’s that collaboration that is key to success in economic development in South Dakota, Stern said. STURGIS (3/27/2018)— Now in its sixth year, the reverse career day is a chance for Sturgis Brown High School students to learn first-hand about modern manufacturing processes. The program takes place at the Sturgis Industrial Park, which hosts several businesses that depend on machinists. Following the first reverse career day, the Meade School District realized there was a need for skilled machinists. Chad Hedderman, who at the time was the SBHS welding teacher and now is assistant principal at SBHS, said that every business they visited that first year had a computer operated mill or lathe-making parts. “They told us they couldn’t find workers to run them, even though the starting wage was $20-25 per hour,” he said. The school district applied for and received a $90,000 economic development grant and also an additional $100,000 grant from the state through its Future Fund to purchase equipment. The Sturgis Economic Development Corporation also received a $99,999 from the U.S. Department of Agriculture Rural Development that helped with the construction costs associated with building a facility in the industrial park. It now houses the high school machining class. This year, 30 students, five faculty, and two school board members participated in the reverse career day. They learned about the machining process including software programming, CNC programming, and product development. Participants also learned about the coursework required for entry-level success, aptitude, and skill sets necessary to be successful. Bar-Sto Precision Machine was one of the businesses on the tour, which owner Irv Stone brought to Sturgis eight years ago. The family-owned and operated business manufacturers pistol barrels and also does custom gun building. “We strive to provide the very best and most consistent product on the market,” he told the students. Stone whole-heartedly supports the reverse career day program and has hired three Sturgis Brown High School students who have come through the machining program. “The benefit of this program is we get to keep the kids here where they can start their career, maybe raise a family, and stay local,” Stone said. Sturgis Economic Development Corporation President Pat Kurtenbach refers to that practice as “growing our own.” “Here in the industrial park, we are able to train our own future workforce in basic machine tool technology to get them a faster start into the workforce once they graduate from high school,” Kurtenbach said. She said metal-related manufacturing is a large part of Sturgis’s industrial sector and is a huge contributor to the local economy each year. Student Danae Woods said she was interested in manufacturing because although she wants to be a teacher, she plans to do welding in the summer months. Student Samantha Reicher said machining is part of her family’s heritage. “My dad has been building guns since he was little. I think it’s cool. I find it interesting,” she said.